Elmo is inspired to learn a magic trick when he meets magician extraordinaire Justin, who has come to Sesame Street to perform a magic show. But there's one problem...Elmo doesn't know how to do magic! Through Justin's encouragement to practice, work hard and never give up, Elmo embarks on an extraordinary journey. He learns that it's okay to make mistakes and that magic can be found anywhere when you believe in yourself and the power of what's yet to be. Cookie Monster and Gonger uncover the science and fun of baking while Abby Cadabby experiences the transformative abilities of caterpillars. Big Bird learns about the magnifying magic of shadow puppetry while Rosita orchestrates a rhythmic beat using everyday objects around her. And artist Grover mixes up the pigment power of the three primary colors. 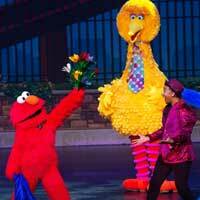 With high-energy dance numbers and a soundtrack that's sure to get everyone out of their seats, Sesame Street Live! Make Your Magic is an inspirational introduction to live theater and the art of illusion that the entire family will enjoy.